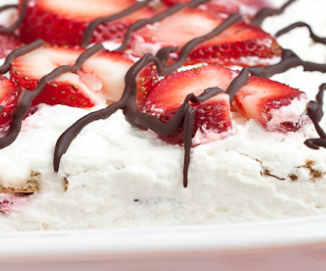 "Strawberry Cheesecake Éclair Cake"recipe is a no bake dessert made with pudding, graham crackers, and strawberries making this delicious and easy to make. Place strawberries is a bowl. Place 30 crackers in a processor to make fine; add more until you have 6 cups of crackers. It takes about 2 cups per layer. Pour the crackers in a large bowl. Melt butter in microwave and pour it into the bowl. Blend the ingredients together until evenly mix. In 9 x 13 inch pan place a layer of graham crackers. In a medium bowl combine the pudding and 1 1/2 containers whipping cream. Spoon 1/3 of this mixture over the cracker layer and spread out smooth. Place another layer of crackers (2 cups) over this layer and top with 1/3 pudding mixture. Place the last layer of crackers over this layer and top with the remaining pudding mixture. Top the remainder of the whipping cream. Place strawberries on top of the cake evenly. Pipe chocolate lines across the top.